Warwickshire skipper Ian Bell has the rare luxury of a full-strength squad to choose from when he leads out the Bears against Hampshire this Sunday. The Bears, looking to emulate their County Championship triumph in 2012, are notoriously slow starters. But, in his first season as captain, after replacing Varun Chopra, Bell, 33, admits they have no excuses. "It is the first time for a long time that we will have everybody available for the start of a season," said Bell. Such has been Warwickshire's contribution to England's ranks for a decade, they have regularly been without Bell, Jonathan Trott, and Chris Woakes, as well as occasional international calls for Boyd Rankin, Chris Wright and Rikki Clarke. "Usually we have been without a couple of myself, Trotty and Woakesie," added Bell. "But we will have Woakesie for the first few weeks, so we're going to have a lot of competition. For the early matches at least, we're going to have to leave out two very good seam bowlers. It will allow us to rotate our seamers the way Yorkshire have done to such good effect in the last couple of years. We won't have to flog our bowlers in the first few weeks." 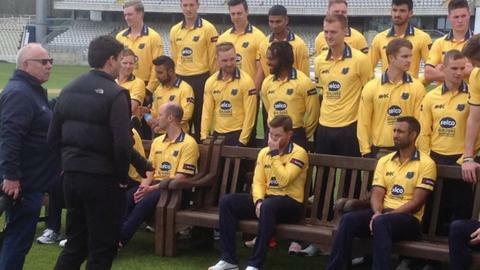 Director of cricket Dougie Brown added: "We're injury free. It's the first time in a long time we've been able to say that. But we're very buoyant. "It's important to get out of the blocks fast. We've got five Championship games in six weeks and we've got Yorkshire and Middlesex in that. There are no gimmies. "With Surrey and Lancashire coming up, the First Division is now as tough as it's ever been. Every game we play is huge." Brown knows that any early-season success for Warwickshire could prove a double-edged sword - if Ian Bell and Chris Woakes do well and improve their England hopes. Bell, dropped by England prior to the South Africa series after 7,727 runs in 118 Tests, still hopes for a recall, as none of his fellow contenders have notably flourished this winter. And Brown will be as delighted as anybody if that happens. "Speaking selfishly, we're delighted we have Belly back with us," Brown told BBC Sport. "Whether it is for all of the season, some of it or just a little part of it. "But we know both he and Chris Woakes have their own aspirations and we hope they get their season off and running." And, if Bell does win back his England place, then Brown has a Plan 'B' in terms of who would lead the side. "Chris Woakes would take over the reins in four-day cricket," he revealed. "And it would be Will Porterfield in one-day cricket." Following their pre-season trip to Dubai, in which they played two T20 friendlies with West Indies, the newly crowned world champions, and a two-day match with neighbours Worcestershire, the Bears opened the domestic season with a first-class friendly against Leeds/Bradford MCCU. They lost the whole of the third day to bad weather but still got in some good batting practice to reach 350-8, thanks to half-centuries from former captains Chopra (86) and Ian Westwood (75) and wicketkeeper Tim Ambrose (54). Keith Barker (3-61), Woakes (2-58) and Rankin (2-42) then contributed as the Yorkshire students replied with 291-9, including 62 from Billy Root, England star Joe Root's younger brother. When the Bears went back in, Sam Hain was out fourth ball but Trott, who made 47 in the first innings, hit his first six scoring shots for four. He made 29, backed by 16 from Woakes as the pair remained unparted on 45-1 on the second and what turned out to be final day. The Bears complete their preparations on Tuesday and Wednesday this week with another two-day friendly against local rivals Worcestershire, ahead of Sunday's trip to Southampton.